My husband is guest posting today with a few tips from his area of expertise – video! When you think of home movies, do the terms “well framed,” “good content,” “excellent lighting” and “superb cinematography” come to your mind? No? Then you must be doing something wrong. Not really. In my opinion, there is nothing quite as painful as watching somebody’s home movies (even my own can cause heartburn). What seemed like a special moment at the moment, doesn’t always carry the same sentimental value when viewed through the lens of time. Hours of small children playing on the carpet, birthday parties, chorus concerts and holiday dinners just don’t make for the great cinematographic soliloquy that inspired you to hit the “record” button in the first place. If you’re reading this, you probably know that Lolli, my wonderful wife, is an avid and constant photographer. You may not know that I am a videographer. When we met, neither of us even owned a camera. It was one of those lucky things that we grew in to as time went by. I began making movies at the age of 9. My oldest brother got a Super 8 film camera for his 13th birthday, and I was an extra in many of his films. To this day, I often reflect on the many “shorts” we made. He’ll never know how much I enjoyed those times, even though he and his friends were usually trying to ditch me. So the question frequently comes up in conversation “How can I shoot good video?” There are lots of things that make a video look good, but expensive equipment and great lighting are not what it takes. Let’s take a look at a few things you can do without buying anything or taking any extra time to film. 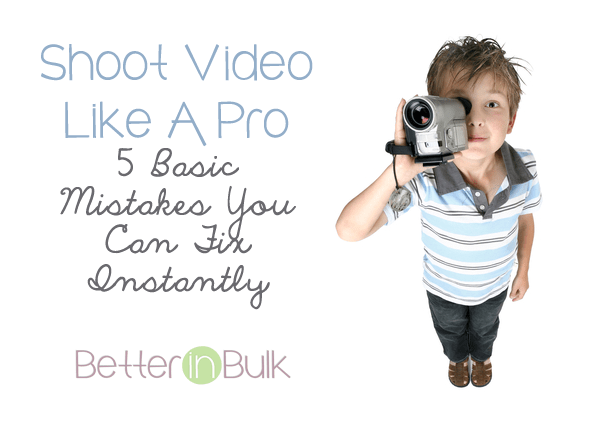 Home movies are usually spontaneous shots and these tips will work like a charm. The next time you watch a movie, notice how when the subject is moving, they will almost always show extra room in front of the person or object. This space will be in the direction that the person or object is moving. Lead room allows you to see what is going to happen. It creates a more comfortable visual because you can’t see from the eyes of the subject, so you need to be able to see what is happening in the direction the subject is moving. The ultimate effect is that there is no surprise and it is less choppy. It also helps you tell the story of what is happening. Video making is story telling. The next time you follow a child across the room, or follow a bird or plane outside, place the subject in the rear third of the frame and keep him or her there as you move the camera to follow the action. It is not uncommon for people to worry about getting the whole subject in the frame, but I am here to tell you that cutting the top of somebody’s head off can be one of the best things you can do. So, when you film a close up, the best way to make that person the true center of attention is to exclude all the details that distract you from paying close attention. Think about when someone wants to whisper something to you. You never look at their clothes or hair. You turn your ear to hear what they have to say. In film, you zoom in close and focus on the face, mouth and sometimes in extreme cases, focus just on part of the mouth. The closer and more cropped the zoom, the more serious or intimate the message. It mimics real life behavior. The rule of thirds is the most basic way to make a dry shot look 100% better. Basically, you picture your frame in 3 equal sections divided vertically and then 3 equal sections divided horizontally. So a frame would have a tic tac toe board drawn on it, stretched to make each section even. You then place your subject close to the left side or right side vertical line. The ideal position in many cases is to have the eyes of your subject very close to the top horizontal line and close to the left side or right side vertical line. This framing applies to the two previous tips (lead space and close ups). If you follow this, even a basic scene will look remarkably better. Here is a really easy tip to follow. Get your finger off that zoom button. Don’t zoom in and out while you are filming. What is zoom really used for? Well, it’s not for changing the framing in and out and in and out. Zoom is best used when you are trying to change the amount of background in the shot or getting a closer view of your subjects. But, that is usually accomplished before the record button is pushed on. Zoom used during a scene is best applied in cases when you are trying to draw specific attention to someone or something. For example, when someone is talking and the mood turns to something very solemn. Or, it could just be that you are trying to focus the attention on the person speaking. It could also be used to change the focus to something going on in the background that is not supposed to be the subject of the scene, but for some reason becomes the central theme. When filming something moving, be sure to zoom out as much as needed to make the scene look smooth. A moving zoom shot will almost always be very bouncy and make people sick watching it, while a moving wide shot will be more pleasing to the eye. When Luke was trying to blow up the Death Star, you felt like you were in his ship with him. That was intentional. The bouncy effect is not quite as enjoyable when watching a kid open a birthday present, so keep the zoom wide when there’s action. Next time you pull out the video camera to capture video of your family, keep these tips in mind. You may not be winning any Academy Awards, but you’ll notice a difference right away. After you’ve captured the perfect home movies, send them in to YesVideo to preserve them for years to come. Note: I am a YesVideo Ambassador and receive compensation for my time, but all opinions expressed within this post are my own. Like I’ve said many times before, I highly recommend using YesVideo to transfer your video memories onto long-lasting digital format. All opinions remain my own. Also, as a disclaimer, I did own a camera when I met my husband but I hardly ever used it. And we didn’t own a video camera until long after we started having kids. Thank you! We hear all the time about how to improve still shots, but no one ever talks about video. This is really helpful! This is something that I really need to work on more!